Welcome to The Abso!ute Sound online! We explore music and the reproduction of music in the home. We believe that the sound of music, unamplified, occurring in a real space is a philosophic absolute against which we may judge the performance of devices designed to reproduce music. Our goal is to provide the resources consumers need to judge how a component's sound either honors or departs from the music's truth, and to make sound purchasing decisions that maximize their experience of reproduced sound. 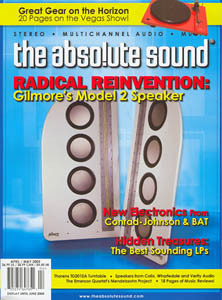 Below is our Issue 153, April/May2005 table of contents and editorial. Overdubbing? Andrew Quint reports on an unusual approach to this classical recording. With a little help from his friends, Jonathan Valin tells us about a bunch of terrific-sounding, lesser-known classical LPs. Join our staff for a trip to Las Vegas, and peek at some very cool new gear. Music Direct's Josh Bizar and Musical Surroundings' Garth Leerer join TAS' Wayne Garcia and Jonathan Valin to discuss the remarkable popularity and staying power of the LP record. Robert Harley moderates. Though it's still in production, Robert Harley considers the Linn Sondek CD12 CD Player to be a future classic. Stephan Harrell reports on the Thorens TD2010 turntable, Insider/Outsider weights, and a nifty VTA device for Rega arms. Moderately priced speakers keep getting better, says Jim Hannon. A new model from C-J has Chris Martens pondering musical truths. Neil Gader weighs the dual nature of this Taiwanese design. Sue Kraft listens to the latest entry-level pair from BAT; Wayne Garcia comments on the VK-55. Shane Buettner on this compact Canadian three-way model. A plethora of goodies from our man in Sea Cliff: a horn-hybrid speaker from Italy's Zingali; more on the VPI Super Scoutmaster — now the Plus; and another go at linestages — this time from Burmester, Conrad-Johnson, Tom Evans Design, Herron, and Lector. A whopping 14 CDs, SACDs, and DVD-As reviewed, including three Vivaldi titles, Evgeni Koroliov's Mozart piano sonatas, and Anthiel's Third Symphony. Coverage of nine discs and records from Dave Douglas, Jason Moran, Revolutionary Ensemble, and Richard Leo Johnson. Reviews of 18 new CDs and LPs, including the latest from Mercury Rev, M. Ward, Kathleen Edwards, Mary Gauthier, Kings of Leon, and Marianne Faithfull, plus a triple-disc set from Nick Cave. A complete system from MBL, Energy V2.3i speaker , SME 30 turntable, And More!